Magic Flavors brand fresh baked German Rye-Wheat bread that is baked the European way in the USA! Tastes as fresh after two weeks, freezes well for 6 month Great for home, outdoors, travel because it is dense and lasts! It has A fragrant golden brown crust to enhance the aromatic rye flavor of the crumb. Paired with four 2 packs of Bavarian Meats Landjaeger Sausage are a well cure to last for weeks, and freezes well too. 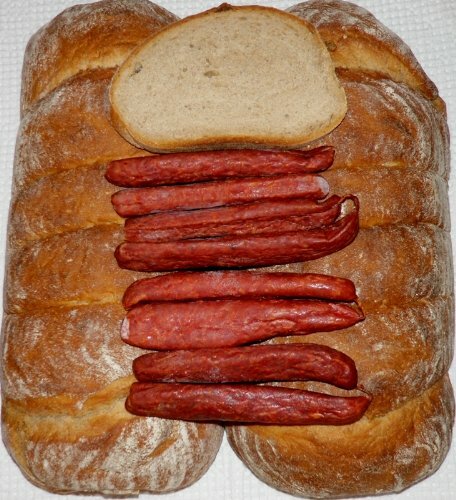 My aunt was born and raised I Germany she just loved the bread, and said that the sausage was authentic.